Rome, Barcelona, Paris – some of the largest cities in Europe, each famous in their own right but also infamous for its pickpockets. You may have already heard rumours and horror stories from friends and family, fellow travellers and tour guides. Particularly for first-time travellers but even for the seasoned trailblazers, it pays to be cautious so here are some tips to follow to avoid your valuable possessions from being nicked! Leave all your valuables locked up at your accommodation. Nowadays, hotels tend to have combination safes in each room and almost all hostels have lockers. Place your spare credit cards, excess cash and especially your passport in a locked, secure place. Of course you’ll need to carry some cash, your debit or credit card and some form of ID with you when you’re out and about. While keeping those cards in a safe place, consider having a decoy on your person too. If you plan on wearing a money belt, fill it with old membership cards and a small amount of cash. This way, if you are robbed, you have something of “value” to hand over to the thieves. Your personal physical safety is of the utmost importance! A friend was held at knifepoint in Peru during her student exchange and this little trick helped her to flee to safety! Avoid going out in the evening, especially in non-populous areas and particularly if you are travelling by yourself or staying in a city that is renowned for being unsafe and/or has a high crime rate. If you must venture out in the dark, ensure you have a safe route back to your accommodation by well-lit public transport, by taking a taxi or notifying fellow travellers or your hotel reception of your whereabouts and expected return time. Obviously we don’t want you to be a caged animal during your holiday. And particular cities may be renowned for having a vibrant nightlife which you want to check out. All we advise is to exercise caution when the sun goes down. Pickpockets are sly, devious and quick with their hands. Some are even bolder. I met a traveller in Italy who told me the story of her mother being an unfortunate victim of daylight robbery. The thief used a knife to slash her side satchel, causing all the contents to fall on the pavement. Her purse was snatched off the ground and the thief disappeared in an instant among the busy streets. For peace of mind, it may be worth investing in a slash proof bag. There are companies that produce several products to provide travellers with the right accessory when on the move. Some of the latest models we have our eyes on include the Flak Sack (Loctote Industrial Bag Company) and the Citysafe Cross Body & Hip Purse (pacsafe). Can you show me where….?! With technology so advanced these days, we have Google Maps and social media at the tips of our fingers. But often, we are so engrossed with our little screens that we aren’t even aware of our surroundings and who may be watching us. A friend was on his way home from work in London. He exited the tube station and went to text his girlfriend that he was almost home. A cyclist whizzed past snatching the phone out of his hands and was already 100m down the street before he had a moment to catch his breath. iPhone gone. Be alert. Don’t be vulnerable. A true adventurous traveller will set out to experience the nice side and not-so-nice side of the cities they visit. Another friend found herself on a crowded train in Milan. Passengers were squeezed in tight and she was required to steady herself by holding the bar above her head. She boarded the train with her camera zipped up in her jacket pocket but unfortunately it was gone by the time she disembarked. It’s of utmost importance to keep your wits about you. Sometimes it will be so damn obvious that you’re a tourist but don’t let yourself panic if you are caught off guard. Trust your instincts. That tingly feeling or that nervous itch that you get when something doesn’t feel quite right. When my parents visited Vietnam, my father had a nagging suspicion that he and my mother were being followed. A young man was staying much too close behind them. Twice, he thought he felt a slight weight on his backpack. He shifted his bag each time but on the third, he heard a zipper. My father turned around instantly to face the same man suddenly intensely staring at his mobile phone, no more than a pace behind him. Be wary of who is around you. Observe your surroundings and trust your gut. Lastly, whilst not a tip per se, we always recommend buying travel insurance before you travel. 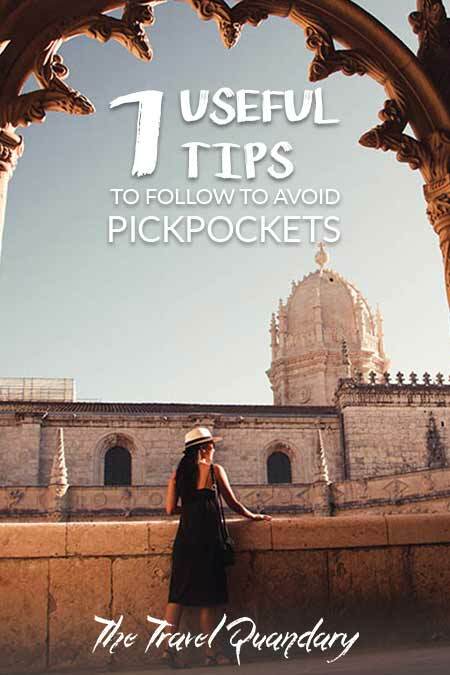 Should you unfortunately be a victim to pickpockets, you will more than likely be able to make a travel insurance claim. Have you or someone you’ve met ever been pickpocketed? Do you have any further advice to keep your possessions safe when you travel? We’d love to hear from you so share in the comments below!